Bestie Twin Nails with Fashion Footing - Round 10! Good morning polished world! How are you all today? I'm thrilled that it is Saturday because that means I don't have to work and I can be lazy all day long. Well, I won't be as lazy as I want because I have a few things to do. This is why there needs to be a day in between Saturday and Sunday; so I can do chores and have two other days to be completely lazy. I was almost too lazy to write this post, but I couldn't do that since Amanda from Fashion Footing is relying on me to post alongside her for another round of Bestie Twin Nails. Can you believe we already have done 10 posts together!? It's so weird to think that we started this ten months ago....where did the time go?? We were inspired by this design by ana0m on Instagram, Since St. Patrick's Day is around the corner, we went for something kind of green, but wasn't "In your face" St Patrick's Day. Maybe next year I can get Amanda to do a pot of gold or a shamrock on her nails. I love Orly Gumdrop. It has to be one of my favorite polishes. These pictures are making it look to be more blue, when really it tends to be more minty. Or maybe I just think in person it's more minty green. I just did a quick search for swatches of this shade, and they all seem to look the same blue tinged as this does. Regardless, it's an awesome polish from Orly which applies evenly in two coats. I need to grab a back up bottle despite mine still being half full and pretty much brand new without any goopiness. As I've said before in another post where used Sterling Sculpture, this is by far my favorite silver glitter. I love the variation of sizes of the silver flecks. 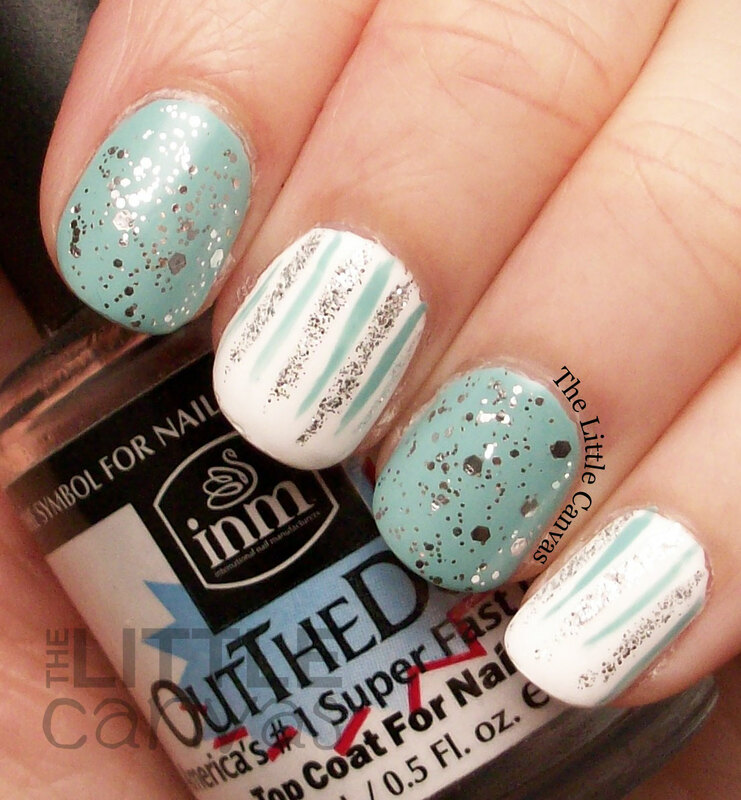 It applies perfectly in one coat and requires no placement or dabbing of glitter to fill in naked spots. They did such a great job with this glitter topper. 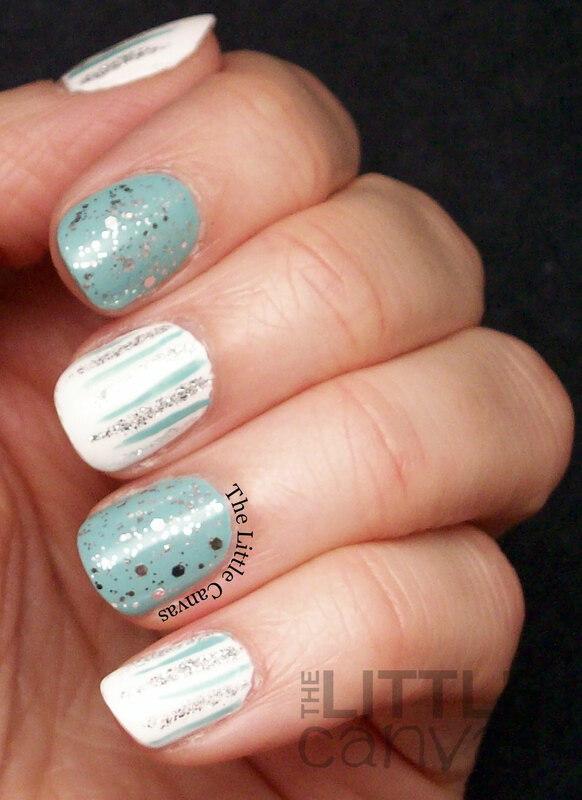 For my design, I decided to use Silver Bells, which is a fine silver microglitter. I felt this would be better to create the waterfall look with over the chunkier glitter. I worked pretty well for a waterfall. I dipped an old striper into the bottle and had to go over the lines twice to get as much of the silver micro that I did, but it was worth it. What do you think? Fan of the waterfall look? This is my first waterfall manicure and I'm kind of loving it. 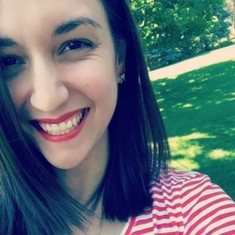 Make sure to check out Amanda's post! I'm off to do my errands so I can come back and paint my nails for St. Patrick's Day. Now that the blog is all festive, I should at least do one festive manicure, don't you think? And goodness, Easter is right around the corner!!! Might have to slap together an Easter Nail Art Wheel! Easter Bestie Twin Nails with 25 Sweet Peas! ORLY Color AMP'D Frozen Collection Press Release! Twinsie Tuesday: St. Patrick's Day! Leopard Print Manicure with a Pixie Dust! 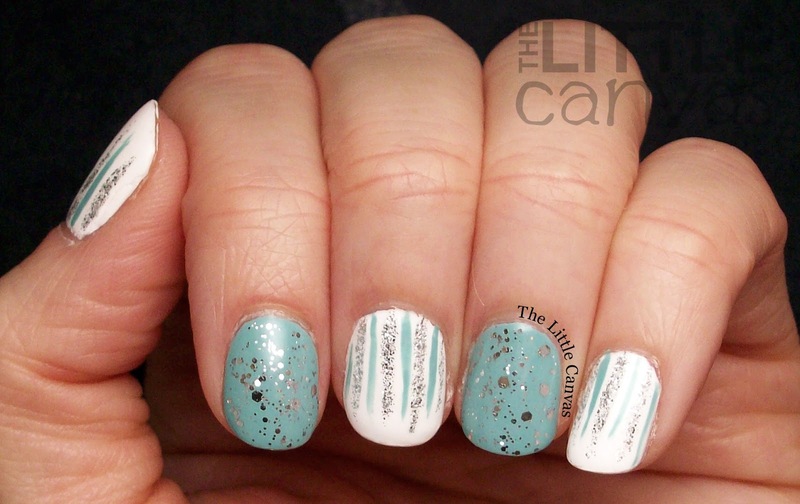 March Nail Artist of the Month: 25_SweetPea!